Memory fascinates us. You know Dustin Hoffman in Rain Man, how he could pluck peoples’ numbers out of his head after perusing the phone book a single time (or, at least, after making it halfway through “G”)? Well, that character was based off of a real-life guy named Kim Peek who could accurately recall over 12,000 books and whose father said he started memorizing things at the tender age of 16 months. He’s not the only well-known person with unearthly powers of recollection. Nineteenth-century scientist Nikola Tesla supposedly had an eidetic (aka photographic) memory, and in the 1970s, researcher John Merritt tested a Harvard student named Elizabeth who perfectly recalled and reproduced random patterns of dots. Sure, some have expressed skepticism about the entire phenomenon, but one thing is certain: Most of us don’t have it! Indeed, repetition is the watchword for us ordinary folks. It’s how we remember the most basic things, and it’s why children nag, students study mathematical tables—and marketers combine SMS with other forms of advertising. 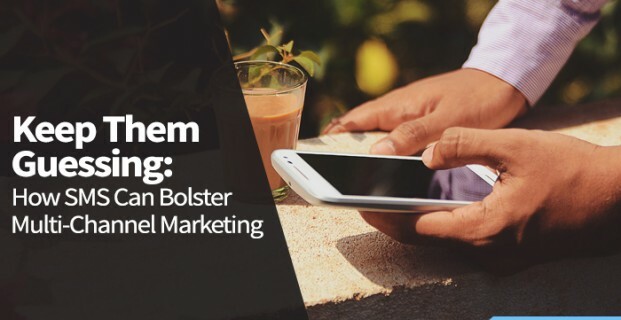 In a December 23, 2016, article in Mobile Marketer, Salesforce.com’s Melinda Krueger discusses why businesses should integrate SMS into their email and push-notification campaigns. That word “integrate” deserves a little explanation. Krueger begins her piece by noting how “75 percent of consumers expect a consistent experience across channels and 73 percent said they are somewhat or extremely likely to switch when they do not get it.” The catch? In her survey of the market, she said that only “20 percent of the messages sent were repetitions—or amplifications, as I think of them—messages that were the same in one or more channels.” In other words, the messages sent between these three channels rarely meshed with one another, formed a consistent and coherent whole, were integrated. Many marketing types might think that repeating the same message time and again would prove counterproductive. “I have heard marketers talk about wanting to avoid repetition, but I think they over-estimate their customers’ attention and focus,” Krueger says. “With attention spans shrinking and mobile devices dominating, you can see how mastering short-form messaging will be a key skill for marketers of the future.” It’s also how we humans learn. Messages hit once. And then again. And then again and again and again. Eventually, they find a crack in our short-term memory and tunnel their way into long-term recall. That’s the sweet spot for every marketer. Also, Krueger’s research shows that consumers like it that way, and no wonder. A decade ago, a study from the Donald Bren School of Information and Computer Sciences at the University of California, Irvine, discovered that employees get to focus on any individual device while at work for only (wait for it!) three minutes and five seconds. Three minutes! “We don’t have work days—we have work minutes that last all day,” stated Gallup, which interviewed the study’s head, Dr. Gloria Mark. With such constant interruptions, it’s easy to understand why consumers would want multiple channels reminding them that their prescriptions are ready or that there’s a flash sale at their favorite boutique or that they can redeem a coupon for a free appetizer at a great restaurant. Messages that come from different corners keep them guessing, awaken their attention, and force them to remember. The busyness of life demands it, and SMS plays a vital role in reinforcing the messages sent through email and push campaigns.